Me: How come I can’t find any Twizzlers at the stores here? Friend: TWIZZLERS?!?! Ewwwwwwww. What are you from the East Coast? Here, have some Red Vines. They are WAY better. Me: Dude, these taste like plastic. Sugary, vaguely strawberry-flavored plastic, but still plastic. Friend: Well, Twizzlers taste like wax. Maybe all that wax coated your tongue and damaged your taste buds. Have some more Red Vines. You’ll see they’re way better and give up your evil, Twizzler-eating ways. And thus I got involved in the Great Licorice Debate. I did an informal poll and found that all the people I knew back east were Twizzler people and all my new friends in the west loved Red Vines. Both sides scoffed at each other for their preferences and so far, no real accord has been reached. Fortunately, I can now get Twizzlers on both coasts – and Red Vines, if I so choose. I got used to eating Red Vines because they were everywhere but, as so often happens, I never got over my first love. I have to say I’m still a Twizzlers girl at heart. What about you? Which is better? Twizzlers or Red Vines? at Old Time Candy Co.
i’m not usually a blog commenter, but FYI: none of the things you mentioned above are LICORICE! they are red candies. licorice is black and anise flavored. so please don’t call yourself a licorice lover! Being a West Coast girl, I have to say I prefer Red Vines. I had no tolerance for Twizzlers when I was younger, but I have learned to like the taste over the years. I will add that I like real black licorice the best though. I’d have to agree that the Australian soft licorice trumps both Twizzlers and Red Vines any day. Twizzlers!!!! I like SF Red Vines tho, I think they’re softer and taste better than the regular. LOOOOOVE Twizzlers tho. But I absolutely adore REAL black licorice. i grew up in buffalo, ny. i’ve lived in los angeles for 5 years. red vines are nasty nasty nasty. i’ve never grown accustomed to the taste. I grew up in Iowa, but I was born in Oregon and when I went back to visit one summer at age 7, my Grandma had a big tub of Red Vines waiting for us. That big tub of delicious candy was at the ready all summer long, and these days, at age 22, I get the occasional craving for Red Vines. But Twizzlers are completely different, they too are delicious, but without such a strong flavor. I’d really say it’s an apple and oranges situation here…even if they are trying to sell the same “Strawberry rope” concept. @ Frith: I LOVE Darrell Lea! I wrote a post about how much I miss my old grocery store, Trader Joes, because I don’t get my Darrell Lea fix. Darrell Lea rocks. @ Darcy: Glad you decided to join in the discussion! I love black licorice. Actually, I know it’s weird, but I crave it something wicked sometimes. @ Angie and Miss Tiffie: Have you guys tried the Panda black licorice? I think it’s yummy. Callard and Bowser also used to make this awesome black licorice toffee chew thingy that rocked. If you see some, I highly recommend it. @ Meredith: I hate to tell you, but if you live in LA long enough, the Red Vines grow on you. They are everywhere. People have huge tubs of them on their desks. I just kept trying them until one day I realized that they’d grown on me! @ Krista: I didn’t have anyone from the states “in the middle” on my poll. Silly me! Thanks for your input and I loved the Grandma story! Grew up in Syracuse, NY, now live in New Hampshire. I’m a huge fan of Twizzlers. I’ve tried Red Vines, and like you said, they taste like plastic. Found them to be a much tougher chew than Twizzlers, too. I was born in Seattle but grew up in Virginia… apparently those few formative years on the West Coast made their mark, since I absolutely adore (fresh) Red Vines. I only discovered them in my college years, but ever since then I’ve been unable to enjoy Twizzlers as much as I did as a kid. The trouble is finding those elusive fresh Red Vines – many of the packages I get are stale, which just ruins the entire experience. Still, given the choice, I’ll always go with the Vines. I can’t stand Twizzlers. They are too strawberry-ish for my taste. My sister, who grew up in Missouri, just told me that she prefers neither. Maybe the middle of the US prefers both or neither as a general rule, and it is the coasts that fight over which is better? Licorice for me!!! The smell of Red Vines creeps me out! Twizzlers…definitely…Twizzlers rock! Both their flavor & texture are more substantial. 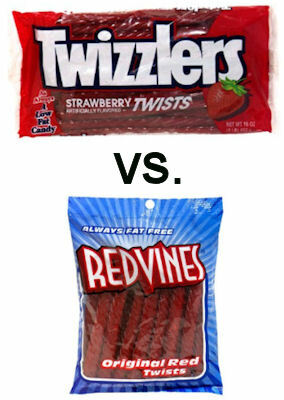 Red Vines all the way, twizzlers are like eating shoe leather. I grew up in Southern California, and I love love love Red Vines. Twizzlers are soooo gross. I can’t handle the aftertaste at all. It’s Red Vines all the way! Im from CA and i LOVE REDVINES. twizzlers always seemed flavorless and like they were made of rubber and wax. It has nothing to do w/ my location, i just find redvines WAY better. despite being a west coast boy at heart, i always hated red vines and adore twizzlers. i know, i know… like eating a candy. but some of those scented candles smell really yummy! Twizzlers top the list of things I hate about the East Coast. They’re disgusting…but I am guilty of munching on those rubbery things once or twice. I was desperate. Red Vines hands down for this Cali native. TWIZZLERS all the way! Red Vines aren’t even all that red, they’re all pinkish and anemic-looking. I could never eat a dead country star. i was born and raised in minnesota and i like twizzlers but my fave is the chocolate twizzlers. i’ll eat the red, but only every once in a blue moon. Red Vines are not licorice. They’re not candy. They’re not even edible — they’re wrong in every way. Just wrong. I LOVE candy, pretty much all candy, but I would rather starve than eat one of these sugary-muck coated recycled soda bottles. Ugh. Red Vines. Yuck! I grew up entirely on the west coast, and I grew up with Twizzlers. I don’t really consider either one to be licorice, but let’s just pretend it is for this comment- I really do enjoy the taste and the texture of Twizzlers, in any format. Red Vines are crumbly and always make my stomach hurt. As far as black licorice goes though, I think they’re pretty even in quality. i like twizzlers as the red vines we can get out here are stale. but the best licorice candy i’ve ever had is the stuff my folks bring back from PA. i can’t even tell you the brand. it could be store brand for all i can remember. they are shorter than twizzlers, but have a much better flavor than twizzlers or redvines and they are a bit thicker which makes the hole in the middle bigger too so it’s easier to use as a straw. we would also get black licorice flavor for my mom as well as chocolate flavor. no plastic taste and no funny after taste. though the chocolate ones kinda coated your tongue after awhile but you were headed for a stomach ache at that point anyway. RED VINES!!!!!!!! I’ve never really cared much for Twizzlers; I don’t even consider them to be licorice. They do taste kinda bland and waxy. I grew up on the West cost with both candies, and I still prefer Red Vines. I live in Texas, and we have both redvines, and twizzlers down here, but I will ALWAYS LOVE TWIZZLERS!!!!!!! Grew up in the North East and I live in Las Vegas. Twizzlers all day! Red Vines are very plastic, plus I have found that after a bunch of Red Vines that they kind of affect the back of my throat and roof of my mouth. It’s just a gross experience. hey darcy!! just cause candace likes twizzlers doesn’t me she doesn’t like plain licorice! I live in Missouri-no coast war for me. But I have to say that Twizzlers win with me, hands down. Red vines are…just…wrong. Like those wax lips you get on halloween…shudder. Can’t use Twizzlers as a straw. One of the best parts of growing up on the West Coast was to get Red Vines and a can of soda, bite the top and bottom and use as a straw to drink soda (my preference was a lemon-lime like Sprite). ZOMG!! I am eating RED VINES right now–they are so waxy, which I LOVE!!! Reminds me of eating wax lips. Twizzlers are good sometimes too —I like eating all kinds of things, like 5th Avenue Bars and escargot. I also like to make werewolf movies and love anything to do with pepper shakers. I’m from Phoenix and grew up eating red vines and buttered popcorn in the movies. So good. One day as a youngin I was handed some twizzlers thinking that they would taste like red vines. WRONG. It was a crying shame. I cringe at the sight of a twizzlers wrapper. East coast baby – Twizzlers rule! East coast here, love my Twizzies. Never had a red vine, they simply look cheap and unappetizing. Maybe it’s the packaging. But they scream ‘knock-off’ to me. And I’ll eat the strawberry if offered, I’d never buy them. The black is what I need. Just made a NIBS run. Almost impossible to find, had to call Hershey, Target had them. The rep there confirmed my comment that the NIBS were really not the same composite as the Twizzler licorice twists. I get a powerful craving for the NIBS once in a blue moon, and nothing else will do. Born in North Dakota raised by a Twizzler eating mom, but she actually used to buy the cherry flavor Twizzler bites, which are even better than the strawberry twizzlers. The nibs are good too, I actually had them in rope form last month, they were really good. I think everyone likes what they are used to. The red vines look like generic brand. As a kid I think I used them as straws too but eating them after being soaked they were just pastie and nasty. So I guess they were cool as a straw just never liked eating them. You and your friend have it wrong though, Red Vines taste like wax, Twizzlers like plastic. I’m from Glendale Cali, I grew up eating Red Vines, loving it! Still do, it’s still my favorite, however, I ate Twizzlers about 4 years ago, and my first time eating it was disgusting, I hated the fake looking plastic waxy look, and the taste. Now, every time I go somewhere, even though Red Vines are my favorite, I HAVE TO HAVE TWIZZLERS WITH ME! I have grown to actually like it a lot! So i’m practically on both sides! Oh and you werdos stop crying about how there candy twists and not that disgusting black licirice that my 97 year old grama likes. That stuff is nasty. People call strawberry candy twists like ppl call tissue kleenex. Get over it. and they were nasty! It took an effort for me to finish it. i haven’t tried either ( none in england) but ive got some off the internet (should be here today) just because of starkid :L but i think all these arguments over which is better are invalid, it looks like it depends which you grew up eating. Twizzlers are my favorite, but ONLY the strawberry flavor and NEVER the pull-and-peel variety (ick). I agree with Meg, it probably does depend on where you grew up. I have a friend who moved to the Midwest (where I grew up) after growing up for the most part in the Northwest and she can’t get enough of Red Vines and hates Twizzlers. I tried Red Vines on her recommendation. I don’t hate them but I usually feel sick after eating an entire (small) bag of them. I don’t like the taste – it definitely tastes waxy to me. I would love to see someone do a taste test of these – someone who has never had either brand. People who like twizzlers better are just wrong. I grew up in Texas, and had both available my whole life. Twizzlers are like bland red vinyl. Red vines actually taste like candy. Solved. Oh and I have to agree Darrel lea = beat licorice ever! !